I am overwhelmed by all of your kind comments. Thank you all so much for taking the time to let me know I'm not alone. There is comfort in being reminded that others have felt or are feeling the same thing you feel. Especially during the stinky times life hands us. I had lunch with a sweet friend today whom I always enjoy spending time with. 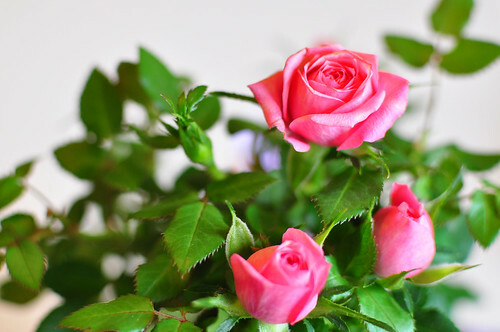 She brought me some mini pink roses in an attempt "restore my faith in humanity". I probably went overboard yesterday, but I think I got to that point where my extreme anger over the break-in turned to sadness and I needed to vent. Thank you all for being there. And thank you, S, for the gorgeous roses and lunch company. I think I'm going to keep the roses in my sewing room all to myself! I picked up a few things at my LQS Monday and then stopped at Hobby Lobby for a fabric pen (for the siggy swap) yesterday. Nothing like a little retail therapy! 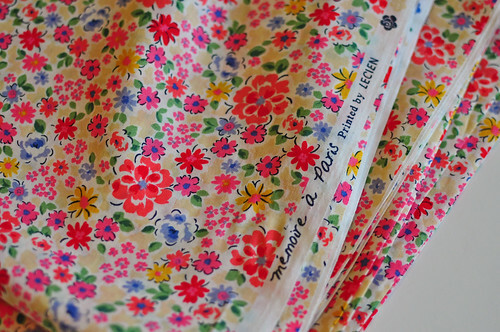 Two and a half yards of a lovely, buttery soft Lecien floral. I think this needs to become a light summer tunic in my size. Some adorable Lecien Minny Mu and some fun Rainy Days and Mondays polka dots. I'm using the dots for my Modern Siggy Swap blocks. 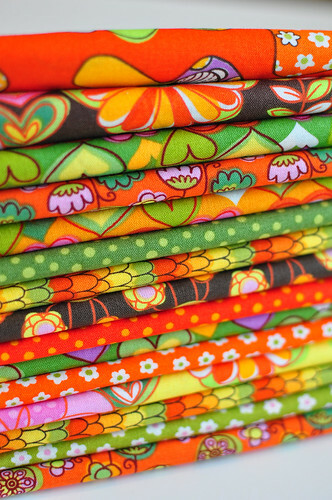 A fat quarter bundle of Jennifer Paganelli's Dance with Me from the sale bin at the LQS. No plans for these yet, but I love the colors. And, another fat quarter bundle of Windham's Merry Mushroom to add to my collection. I bought two bundles at Joann Fabrics a while back, but I found a bundle at Hobby Lobby yesterday with the brown prints, so I needed to have that one too. No plans for these yet either, but I adore the funky colors and fun prints. Not too much sewing going on today, but I want to make this adorable ruffle tote! I'm concerned about it looking like a diaper or baby bag though, so I can't decide on fabrics. Any suggestions? How nice of your friend to bring you flowers! She's a keeper! 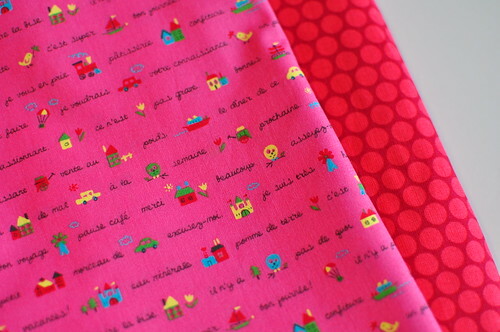 I am loving your new fabric purchases, but especially that Lecien Minny Mu fabric. It is a great bag! So sorry to hear of your news. And a good cry was certainly in order. About that tote, it's really cute, but I'd go further with the ruffles, just making them as full as you can. That's the point of it, right? Oh, I'd love a dress like that. P.S. 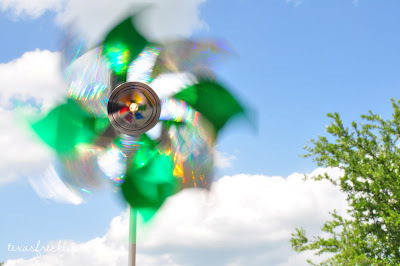 Thank you for becoming a follower on my blog! Absolutely love that first Lecien fabric! You score the most beautiful fabrics locally! Wow, love your choices, does your LQS sell online? So sorry to hear of your mother's burglary. Looks like your friend knew something that would make you happy! and you knew where to find others! 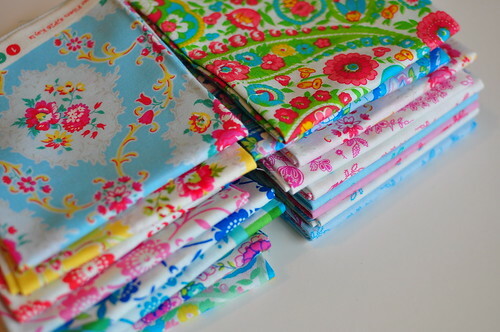 Your fabric choices are beautiful!! Your last post was so touching and I'm so sorry your mother's home was violated like that. I still have my daddy but it's posts like this that remind me to hug him more often. I actually came to your darling blog to tell you that you won the drawing on my blog (the Paula Prass FQ stack and 4 patterns). Just set it all next to those beautiful roses and smile because there are no such things as coincidences. now THAT will put a smile on your face! Whatever it takes, whatever it takes! I hope things are looking up for you!